Smart marketers realize the importance of establishing a strong presence across digital channels to seize a greater share of the market. But how can marketers widen their reach while maintaining control over their messaging across so many channels? Chief Marketing Officers (CMOs) worldwide struggle with this paradox as they pursue MultiChannel Marketing (MCM) to tap key revenue streams. Ignoring certain channels is not an option: The result is a devastating loss of revenue as rival companies quickly fill gaps in underserved channels. 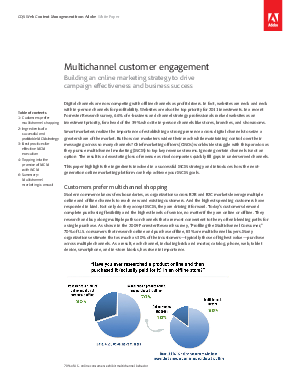 This paper highlights the ingredients involved in a successful MCM strategy and introduces how the next-generation online marketing platform can help achieve your MCM goals.